External financing needed and growth are obviously related. All other things staying the same, the higher the rate of growth in sales or assets, the greater will be the need for external financing. 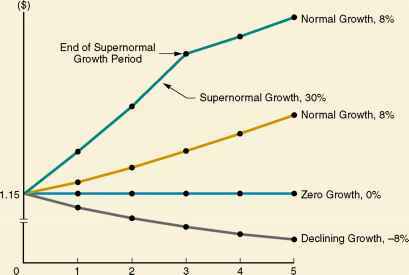 In the previous section, we took a growth rate as given, and then we determined the amount of external financing needed to support that growth. In this section, we turn things around a bit. We will take the firm's financial policy as given and then examine the relationship between that financial policy and the firm's ability to finance new investments and thereby grow. Once again, we emphasize that we are focusing on growth not because growth is an appropriate goal; instead, for our purposes, growth is simply a convenient means of examining the interactions between investment and financing decisions. In effect, we assume that the use of growth as a basis for planning is just a reflection of the very high level of aggregation used in the planning process.